You might be wondering why a lot of people transfer the contents of their whiskey to a decanter. Is it just for show? Or is there a deeper meaning as to why a huge population of drinkers decant their liquor. One thing’s for sure, decanting your liquor isn’t only for TV and movies. There are a lot of reasons as to why people decant their liquor. While some people do it for the prestige, there are others that believe decanting their whiskey will have a lasting effect on the liquor. No matter what their reason may be, they’re all willing to exchange the brands’ bottle for something else. That’s why in this article, we will be exploring the different reasons as to why people decant their whiskey and why you should too. Good looks are just the tip of the iceberg when it comes to storing your liquor in a beautiful crystal decanter. That’s why before anything else, here’s everything you need to know about decanting your whiskey. Before we dive into what happens when you decant your liquor, we will first discuss the factors that affect the taste and quality of your whiskey. As we know, there are various factors that could affect the taste of liquor; the most relevant factor being the temperature or exposure to sunlight. Sunlight might be the biggest factor that affects the quality of your liquor. You might not notice it first, but there’s a chemical reaction going on when you leave a bottle of whiskey exposed to sunlight. It can cloud your drink or even change its flavor completely when you expose it long enough. Another factor that could affect the taste of your liquor is exposure to air. Exposing it to oxygen will significantly change the taste of the whiskey and alter its alcohol levels. This is the reason why liquors such as whiskey are being kept tightly sealed in their bottles. There is a lot of talk when it comes to decanting your liquor. Some people believe that decanting is nothing more than a decoration. But others believe that it’s more than just a pretty bottle. Believe it or not, decanting your liquor affects your drink even if it’s just in a minimal level. Decanting was made popular by wine drinkers because decanting wine removes some of the sediments present in wine when you transfer it. Whether it changes the flavor completely or not, there are still a lot of people decanting their branded liquor. People decant their liquor for various reasons. One reason is that when their bottle cracks or when the cap loosens they transfer it to decanters. This might be the most acceptable reason for some who criticize this practice. Another reason is that they transfer the liquor to a decanter to give it a beautiful home. No matter what the brand is there are those who prefer to put their whiskey in a bottle of their choice. You can also hide cheap whiskey in your decanter and pretend that it’s a high-class and expensive liquor to trick your friends. This way you can tell whether your friends have what it takes to be a whiskey expert like yourself. From the time your whiskey leaves the barrel and bottled in its signature container, the process takes a lot of time and effort. Generally speaking, when it’s already bottled it’s already considered as a finished product. And no matter how long you keep it inside your whiskey cellar, a 10-year-old whiskey will remain as such even if you keep it locked up for a hundred years. The contents of the bottle will remain almost the same as long as it’s not exposed to the factors that might affect its quality. The reason why your liquor has to be transferred into a bottle is that when it stays longer than the intended period inside of the barrel the flavor changes. This has something to do with the barrel where it gets most of its flavor. That’s why if you transfer it in a bottle the flavor of the liquor doesn’t change because the bottle doesn’t affect the flavor. The same is true when you decant your whiskey. When you transfer the liquor into your decanter, the state of the liquor will remain the same. The only difference is that depending on the decanter, it can have more space and it can block more sunlight than your average bottle. People sometimes compare whiskey and wine when it comes to storing liquor in decanters. The difference between the two is that when you store wine in a decanter, there is a high probability that the flavor of the wine will change. Depending on the decanter and the manner of storage, the flavor of the wine will change for better or for worse. Wine doesn’t depend solely on the barrel to change its flavor. There are other factors that affect the value of wine that’s why when you decant your wine the flavor significantly changes. Another factor is that wine has a relatively lower alcohol content which also affects the chemical change in the bottle. There is a big difference in alcohol content between whiskey and wine. This is why whiskey doesn’t change much when you decide to decant it as compared to a bottle of wine. More importantly, when you decant this liquor the oxidation process that happens in a decanter is slower. Just be careful not to expose the decanted liquor to direct sunlight. A sudden change of the temperature around the bottle will slowly change its appearance. Some people have claimed that the bottle clouds and that the flavor suddenly tastes a little less like whiskey. Don’t be confused when dealing with decanters. When you decide to buy a decanter make sure that you buy the right one. This means that you must buy a decanter for a whiskey. Yes, there are two types of decanters that are being sold in the market today. To tell whether the decanter is for wine or whiskey, here’s what you need to look for. Wine decanters usually have no caps. This is to allow the air to interact with the wine inside the bottle. The bottle also looks as if it’s highly breakable. The appearance of whiskey decanters is sturdy and well-built. They often have a tight cap that prevents air from entering the bottle. This is to prevent any chemical change that might occur inside of the bottle. 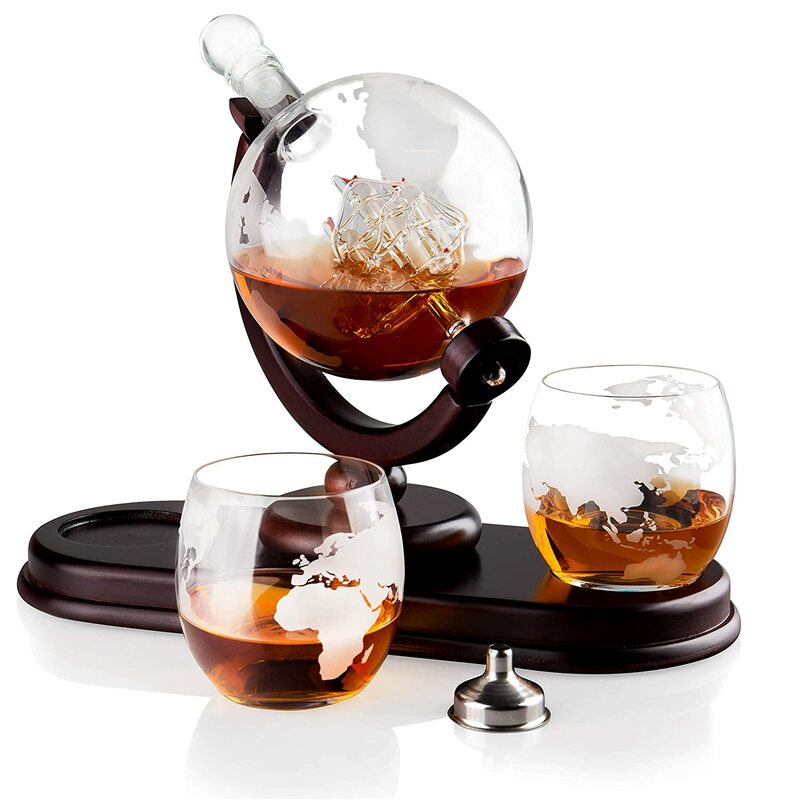 The decanter often has a lucrative design to attract its consumers. Decanters are easy to find especially in liquor stores and home depots. But what kind of decanter should you use just in case you need one? Here’s a simple guide for you to follow to get the best decanter in the market today. What you want to look for is a quality decanter made from lead-free crystal or glass. This will make sure that the liquor in your decanter will not change flavor because of the presence of lead in the bottle. Lead is dangerous for many reasons, and the most dangerous reason is that it can poison your drink. Another feature that you need to look for is that it has an airtight seal or cap. Whiskey doesn’t go well with oxygen. As stated earlier, oxygen destroys the flavor of the whiskey when it’s exposed for long hours. Make sure that you find a decanter that doesn’t leak air in the bottle. If you love giving your liquor some additional aesthetics and some fancy feel to it then be my guest. There’s no harm in transferring your liquor to another container that obviously has a better look. There are those who appreciate these kinds of things because it brings out the best in ones drink. Decanters are a unique way of enjoying your liquor. It doesn’t matter what people say about this practice. As long as you fulfill what you desire and feel special when using fancy decanters, by all means, indulge yourself in these classy bottles. What about you? Do you use a decanter? Tell us in the comments below.